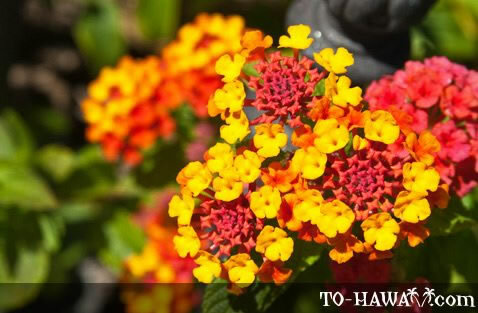 Lantana is a shrub that blooms continuously. The flowers are a bright yellow and orange and look pretty. However, the shrub is armed with thorns and the plant often grows into an impenetrable thicket, so people in Hawaii rather consider it an annoyance or pest. It has infiltrated rangelands and forests and biologists have even brought insects that are known to parasitize this plant in order to get rid of it. These attempts have been very successful.